During the West African Drumming Week, we’ll be exploring the Mande musical tradition – more of which can be read (and seen in videos) just below this introductory section on the history of Mande drumming. 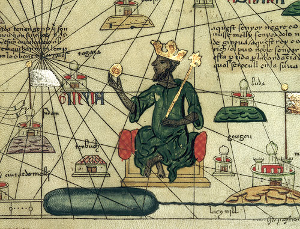 In 1235, the Mande warrior king named Sunjata Keita rose to power and united many kingdoms in West Africa to establish the Mande empire and what would be a 200-year golden age of peace and prosperity in the region. Musicians at this time were more than just musicians. They were highly valued as negotiators, praise singers and historians. This history and its musical tradition lives on in a large part of west African countries, including Mali, Guinea, Gambia, Senegal, Ivory Coast, Burkina Faso, and Guinea Bissau as well as parts of Nigeria, Sierra Leone, and Liberia. By the way, the story of Sunjata Keita is incredible since he was born a cripple and was exiled from his home because of this. Yet, he not only overcame his disabilities but established the prosperous Mande empire. More youth-oriented information can be read here: http://www.africa-junior.com/en/youth/knowledges/sundiata-keita.html. Guest host AnnA Melnikoff , with her expertise in the Mande drumming tradition, will guide us through this week’s activities. She’ll be bringing her exquisite drums which include djembes and a set of 3 bass drums called dunun. Each dunun has its own pattern which overlap with one another to form a melody upon which djembes can solo. In this week, you’ll get a chance to learn the various dunun patterns, djembe accompaniment patterns as well as a group djembe solo. Focusing on rhythms that accompany rights of passage, participants will also build masks and explore the meaning of the drums and the rhythms from the very ancient Mande tradition. Check out the videos below to get a sense of what we’ll be playing in the West African Drumming Week! The 3 drummers standing are playing the dunun – the smallest drum is called the kenkeni, the middle drum is called the sangban and the largest drum is the dundunba. The guys sitting are playing 2 different accompaniment patterns on djembes. This one the drum instructor is demonstrating the 3 different tones on the djembe – tone, slap and bass, or in French “ton,” “claque,” and “bas” . By the way, French is spoken in many West African countries. This video starts with a pattern on the middle dunun drum known as the sangban. Then the kenkeni (the smallest drum) is introduced. Note it is the simplest of all the 3 drum patterns but has the most important role of keeping the beat steady. Finally the bass drum, the dundunba, is introduced. This entry was posted in Blog, Content, West African Drumming and tagged Andrea Kuzmich, camp, fun camp, kid's music, Music, music activities, music camp, musicamp, summer camp, summer music, toronto, toronto camp, West african drumming. Bookmark the permalink. ← What are Circle Songs?